(Chris Queen – JP Media) A couple of weeks ago, I introduced you to the Red Letter Christians, a group of liberal believers whom the New York Times breathlessly profiled recently as the face of Christians who don’t worship Donald Trump. 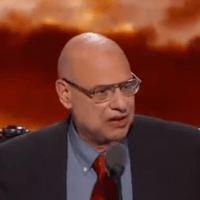 One of the group’s leaders, Tony Campolo, recently gave an interview with Premier, a Christian website in the UK, in which he stated that he doesn’t believe that God is in control — yet. So often we read the scriptures but don’t pay attention to what is really going on. In the temptation story, for instance, Satan says to Jesus: “Here are all the kingdoms of the world, they are mine to give you”. Does Jesus say: “Oh no they’re not”? No, he doesn’t! Of course, he doesn’t cite any of those specific places. He does mention a passage in Ephesians that doesn’t really support his point before he goes off on a tangent about worship music. I have problems with a lot of the new worship music. I think it’s wonderful that it’s captured the music that young people can relate to and they get into it with great love and emotion. But compare ‘My God reigns’ with the old hymns which say: “Jesus shall reign” – it’s future tense, not present tense. The Hallelujah Chorus never says: “God is in control”. It says: “The kingdoms of this world will (when the second coming occurs) become the kingdoms of our God and he shall reign forever and ever hallelujah”.